Rogue One takes this and skips backwards to describe those events in detail. The heroes are older than normal for this kind of film, with their ages ranging from 33 up to late 50s for the majority, and the subject matter it treated in a grimmer, more realistic fashion. The first two acts introduce the large cast of characters, the dark world of the Galactic Civil War, and of course introduces the villains, principally Governor Tarkin and his arch-rival, Director Kreddic. The Death Star is ready, but what they don’t know is that the apparent treasonous weapons designer, Jyn’s father, has placed a weakness deep inside the Death Star. It’s a simple, perhaps obvious plot point that fixes one of the biggest weaknesses of the original film…the exhaust port! 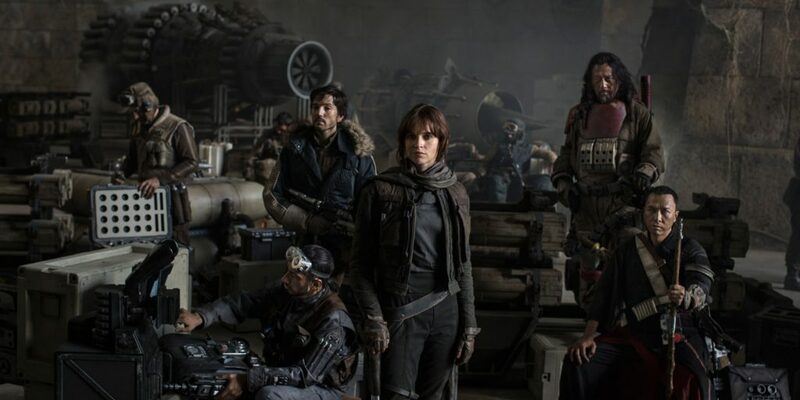 The final act jumps in with Jyn and her new-found friends electing to go it alone to retrieve the plans. It’s an impossible mission, and they know it. Shortly after landing we’re treated to a skirmish that quickly expands to something akin to the Battle for Endor. The space battle retains the feel of the classic trilogy, while bringing in a host of treats for fans. Original unused footage from Star Wars in spliced neatly into the film, along with audio cameos by others. The space battle is desperate, with them buying time for the rebels on the ground. By the time the plans are transmitted, the Death Star has arrived, and begun its reign of terror. The ground teams are wiped out, and it looks like the fleet may not even escape in time when Vader arrives. The last moments of the films are short and violent, and the perfect introduction to the power of Darth Vader. He cuts his way through period perfect 70’s era Rebels until they pass the plans to the crew of Tantive IV. It’s a short scene, and this isn’t Vader’s film, yet we can see that he’s the right-hand man of the Empire, and he will not stop until he has the plans. Perfect. There’s no John Williams here, expect there is. Michael Giacchino utilises the fanfares and themes of Williams, but brings in his own particular vibe. It’s different, just like everything in this film, and it works. If you want to hear the score, visit Spotify and check it out now. What a great cast of adults. Like Alien, this film shows what a cast of grownups looks like in a sci-fi story. It looks real, and each has had time to live a full life, with ups and downs. There are no pushy teens, just those that have seen the worst of life. K-2SO is a badass Imperial Enforcer droid, a kind of tough robot with an attitude that we’ve not seen before. The renegade pilot feels real, and bitter, while Chirrut Îmwe brings mysticism without having to rely on cheap tricks. Gerrera looks exactly as expected, and shows a side to the rebellion that we’ve not seen before. Unlike the prequels, the CGI looks gritty and real. No fake green fields and silly monsters. This could easily be the 70s, and that is all to the good. The work on Tarkin and Leia are almost perfect, perhaps spoiled by the fact we know they are not real. No matter how good or bad the work, this would always jar. Kudos for the effort in putting Tarkin at the centre of the story. The Death Star has never felt more menacing with Tarkin strutting his stuff. The merging of 70s footage is seamless, and everything just looks and feels right. We even finally see Y-Wings doing their thing for a change! Even better, the Star Destroyers and fighters have a plastic, model-like vibe that is in keeping with the original. This is a league apart from the computerised battles of the prequels. Rogue One is a fantastic addition to the core films, and continues the Star Wars tradition better than many of the other films in the series. The film finally puts war in into the story arc, as well as sacrifice and terror. The original characters of Star War, especially Tarkin and the Imperial bureaucracy are given more screen time, all for the greater good of the series. The ending puts the sacrifice of the rebels front and centre to the story, as well as the sheer power and terror of the Empire. A fairy-tale ending is what we’d expect, but not this time. This ending is about war, and many, many die getting the Death Star plans into Leia’s hands. More importantly, Rogue One makes Star War an even better film than it already was. Let’s hope she can get them into the rebellion’s hands! I loved Force Awakens, but Rogue One pips it in that final act. A first class Star Wars film, worthy of Empire Strikes Back. Watch it, you will not be disappointed. ← Black Widows: Episode 5 is out! I am a very huge fan of your books ! I am a viet nam Era veteran , and enjoy the reality you bring to the genre . You include , not only superior war description, but both the pathos and heroism of the common soldier. I have read and will continue to read all your works. Your novels are such that I may relate to your characters strengths and their inherent weakness as well . Thank you very much sir for your efforts . Thank you Mr Fallow, that means a great deal. I try and bring the grey areas into the lives of the military, especially the sacrifice and the long term trauma that comes with their actions. Please keep in touch, your comments are very much appreciated. Have a great 2017.